When I posted last fall about storing winter squash in our basement on Paul's wine racks, some of you requested I follow up to let you know how it went. I'm happy to report that now, in February, we are still enjoying the squash I grew last summer. Butternut and blue hubbard squash at least. The cushaw squash went bad more quickly, so I had to use that all up in October I believe. The whole family adores these winter squashes, and hopefully if I can avoid the future swarms of squash bugs, it will be a winter staple for us in the future. I'm still holding out for that root cellar one day, though! Readers, any of you still munching on things from the 2015 garden? We still have a pile of butternut in the cellar but I have been feeding a few that have gone bad to the chickens. I had one survive last year until planting time. Pumpkins don't hardly last in the garden much less storing them so I don't plant many cushaw anymore. I like butternut best anyway. Ya'll definitely need a root cellar. It could double as a fallout/zombie-apocalypse shelter :-) Both of my grandma's had root cellar's but they were kind of scary to me as a kid. I still have zucchini stored away in the deep freezer. I shredded it up, put 1 1/2 cups in zip-lock bags. That's about what I use when I use it. That's great that it stored so well! Good for you! I'm relying on frozen, now. The Canadian dollar is so bad! Glad that has worked out for you....yum! good job lisa and it looks really yummy! Ad me to that list too, in fact we're having some tonight too! I think in your climate, squashes will be stored well longer. It looks and sounds good. Lisa! Our squash wintered well, but most of it is going to the pigs to supplement their food, with the chickens getting a few helpings as well. I'm not but it sounds smart to me! Winter squashes are my favorite squashes. I have stored them in our basement over the winter but they didn't last as long as yours did on the wine racks. No, my garden only produced one squash, a handful of small tomatoes, and some parsley. I am not successful with vegetables. Glad to hear it is holding out for you. I always have good luck keeping butternut squash through the winter. 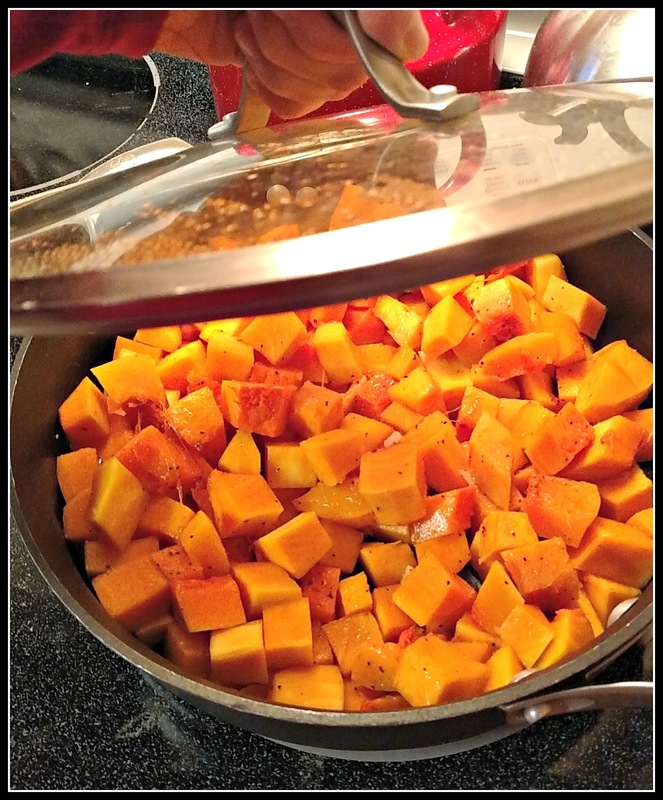 How do you cook this gorgeous pan of squash cubes?